Each year in June, PRDA hosts the Phae Collins Memorial Horse Show. 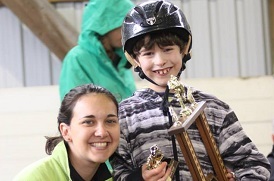 The show is a positive, fun weekend that allows riders to show off their skills to family and friends, while earning ribbons based on their performance. The show runs for two days, with fun classes line Pole Bending, Jumping, Obstacle Course and Equitation on Staturday, and Dressage on Sunday. Thank-you to everyone who attended last year's event. We had a great time and enjoyed watching all the riders compete. We hope to see you again this year!